Taste test: These potato chips were thin and crisp with a mild, tasty vinegar zing, but the most notable thing about them was their color. They were very, very yellow. Bright yellow. The yellowest potato chips we've ever seen. I didn't see anything in the ingredients that sounded like a yellow coloring, so either the yellow came from the potatoes themselves, or there was some sort of secret. 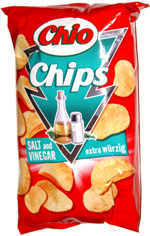 Good vinegar chips from Germany. Smell test: Nice, mild vinegar zing. 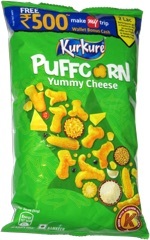 This snack was discovered by Tilman Achtnich, Wolfgang Breuning and Andreas Wetter. Review published .